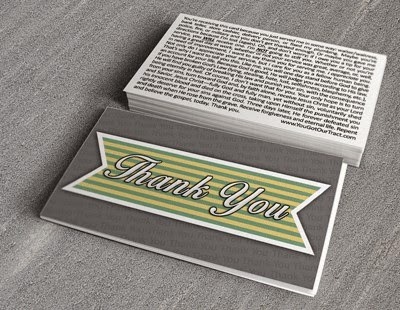 "Thank you for writing the 'Thank You' tracts, Papa Tony! They have been such an encouragement to me to keep sharing Gospel tracts! And they are generally very appreciated! "Today God allowed me to give one to a security guard outside my credit union. When I came back out I saw him reading it. Left one for the teller too (all glory goes to God; I couldn't do it on my own). His name was Daniel. I do not know the name of the officer. Please say a prayer for them. Thanks." One of the many things Ray Comfort taught me during the years I was blessed to work for him was never publish a gospel tract I wouldn't use myself. The "Thank You" gospel tract, one of the several I have now published with Marv Plementosh of One Million Tracts, is one of my favorite tracts. And it has to be the easiest tract to distribute. Distributing this tract is as easy as saying, "Thank you." I've received notes from a number of people who are new to gospel tract distribution--people who would also describe themselves as shy. And each person has told me how this particular tract has made it so much easier for them to step outside of their comfort zones and to engage in biblical evangelism. I don't know if I can receive a better review of one of my gospel tracts than that. Recently I published a gospel tract with Marv Plementosh of One Million Tracts titled: What Comes After Pride? "I work at Avis Budget Maui and when I was cleaning one of the cars, I found this card that said 'What Comes After Pride?' I am a Christian. I use to go to church. And I admit that I am a sinner in a sinful world. That moment when I found the card, God was trying to tell me something, I read the message and the website, and I'm willing to give up myself to Jesus Christ. Thank you very much! & God bless!!" So, the next time someone asks you if gospel tracts are effective, feel free to share this testimony with them. 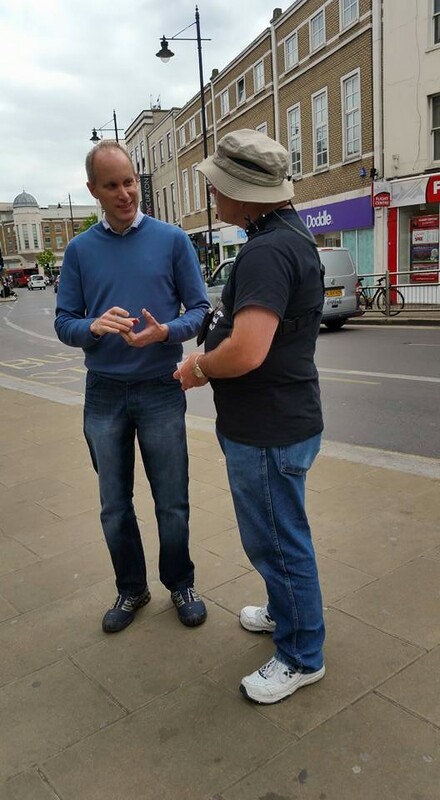 While distributing gospel tracts on Wimbledon Hill Road, in Wimbledon, England, I handed a gospel tract to a man named Martin. When Martin received the tract, he asked what it was. When I explained to Martin that it was a message about Jesus Christ, Martin asserted he was an atheist. What followed was a 15-minute conversation during which Martin acknowledged he had to draw from the Christian worldview to assert any basis for morality and that his godless worldview provided know basis for a morality that was anything more than the arbitrary opinions of people. During the conversation, Martin conceded that his worldview could not give an account for knowledge, logic, or purpose for human existence. Martin lives by faith, but sadly it is faith in meaninglessness. Martin was on his lunch break. He left, not in a huff, but simply due to a lack of time. While I did not get to communicate the gospel with Martin, the paper missionary I gave him went with him as he walked away. Listen now to my conversation with Martin. My friend, Gayle Metcalf, shared the following image today on her Facebook page. My friend, Pastor Geoff Kirkland, posted an article today titled Lessons for Young Men, which included a charge to greater commitment to the Word of God. The above items have been used by the Lord today to bring much conviction to my heart and mind. Great conviction. My cell phone is with me wherever I go. It is my primary source of communication with the world: phone calls, text messages, emails, Instagram, Facebook, Twitter, YouTube, news outlets, the Weather Channel, traffic alerts, law enforcement alerts, my calendar, and Bluetooth for my GoPro camera. The only game on my phone is Chess. The apps that are least often used on my phone are my Bible apps. I prefer the printed page over the electronic page for most of my reading, especially my Bible reading. I am in my Bible every day, more often than not for the edification and evangelization of others. In other words, most of my time spent in the Bible is spent in preparation for writing articles and pulpit sermons, or preparing for sermons I preach in the open-air. An ongoing challenge in my 27 years of Christian living is staying consistent in my Bible reading, for the purpose of worship and devotion. Reading Pastor Geoff's article and seeing the image Gayle posted this morning hit me like a ton of bricks. Making even a cursory, side-by-side comparison today of my daily time on my cell phone with my daily time in my Bible has been shocking to me. Shocking. Appalling. Stomach churning. Discouraging. Convicting. I spend much more time on my phone than I do in my Bible. I do take a Bible with me most places, but not everywhere. On the other hand, I take my phone everywhere. To be without my phone is like being without my house and car keys; it is like being without my wallet or my driver's license. But I can't say I have the same sense of incompleteness, or the sense of not being fully dressed, if I walk out of the house without my Bible the way I do with the before-mentioned items. What does that say about me? What does that say about my love for the Word of God? The above image is a picture of me holding my cell phone and a small Bible, which was given to me (ironically enough) by Pastor Geoff and Elizabeth Kirkland the last time I was guest in their home. I have a preaching Bible. I have a number of study bibles. And I now have a specific use for the compact Bible the Kirklands gave me. Like many people, if I have an idle moment (i.e. standing in line at a store, post office, or some other place; waiting for someone to return from a restaurant restroom; stopped at a red light while driving my car; etc. ), I reach for my phone. I want to change that. 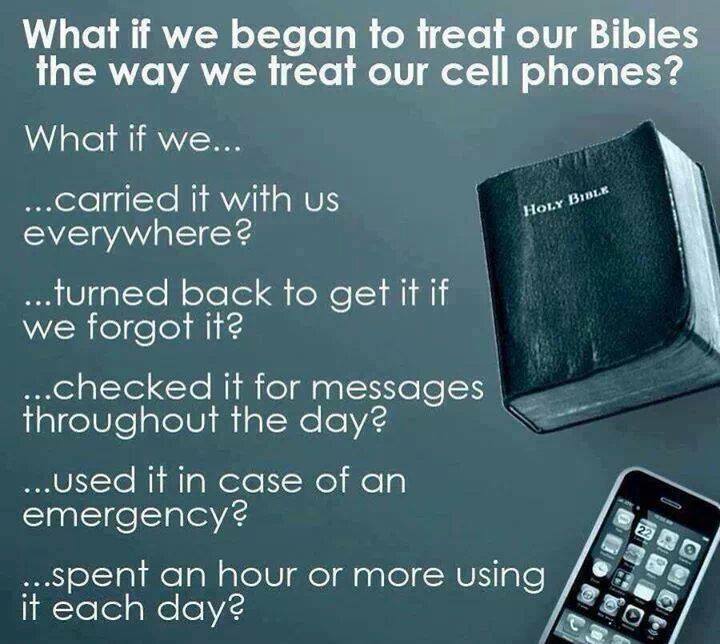 In all of the before-mentioned moments and others, I want to start reaching for my Bible instead of my phone. Ray Comfort often says, "If you find me without a gospel tract in my possession, I will give you $1,000." Ray has yet to pay out to anyone. While I will NOT give you $1,000, I welcome you to hold me accountable if you ever see me without a Bible (the one pictured above or another). Now, I'm not trying to start a "thing." Don't join me in my conviction simply to be part of something. Carry a Bible. Don't carry a Bible. That's up to you. If you want to follow me as I try to follow Christ, then you're welcome to join me in this simple effort to spend more time in the Word. Just know that if you decide to do it, you have NOT joined a new Christian club or fad. If you do it, do it for only the right reasons. Well, here it goes. I hope it lasts. Pray for me. Jerusalem's King is a feature-length documentary, written and directed by Ryan Habbena. My friend, Andy Olson, of Echo Zoe Radio and Blog, served as the film's Director of Photography and had his hands in other aspects of the project. As I watched the film with my family last night, it didn't take me long to discover the true strength of the film. It is an artistic, Scripture-laden, 90-minute summary of the Word of God. More than that (not that that is not enough), Jerusalem's King is a cinematic gospel tract. For 35 years, The Jesus Film has been used by missionaries to present the gospel to more than 200 million people around the world. I can see Jerusalem's King used in a similar way. Filmed almost entirely in Israel, Jerusalem's King takes the viewer on a panoramic tour of the nation where most of the world's greatest history has taken place. As the viewer sees flyovers, views maps, and watches reenactments of some of the Bible's most memorable stories, they are treated to biblical narration, from Genesis to Revelation. Ryan Habbena did an exceptional job making clear the story Scripture has always told--how man can be reconciled to the Sovereign Creator of the Universe, through faith in the sinless Lamb of God, the Messiah, the King of kings and the Lord of lords--Jesus Christ. From the Protoevangelium to the Law, to the History, to the Psalms, to the Prophets, to the New Testament, Habbena visually weaves the tapestry of the Gospel. 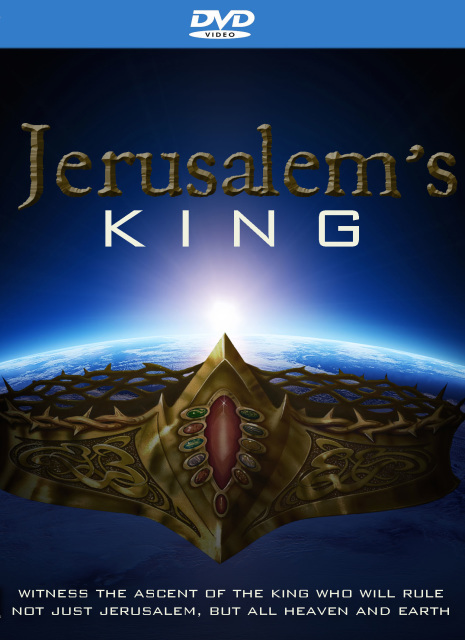 At $8 for the DVD, and $3 for the digital download, Jerusalem's King is affordably priced, allowing for the purchase of the film in bulk. And I recommend you do just that. Purchase as many copies of this film as you can and distribute it like you would a gospel tract. I enjoyed Jerusalem's King, and it will be another weapon in my evangelistic war bag. In partnership with Marv Plementosh of One Million Tracts, I've written a new gospel tract titled What Comes After Pride? While I came up with the general concept, Marv creatively put together this striking design, which utilizes the flag for the Alphabet Soup of sexual immorality (LGBT......letters being added daily). The world defines “pride” as: “a feeling or deep pleasure or satisfaction derived from one's own achievements, the achievements of those with whom one is closely associated, or from qualities or possessions that are widely admired.” Yet the Word of God says a person’s pride is followed by disgrace (Prov. 11:2); pride is arrogance (Prov. 21:24); pride will bring a person low (Prov. 29:23). The Word of God says pride is something evil that comes from a person’s heart (Mark 7:21-23), and that God is opposed to prideful people (James 4:6). God sees pride the same way He sees so many other behaviors—as sinful (2 Tim. 3:1-4). God sees pride as evil because it is contrary to who He is. Jesus Christ, God in the flesh, humbled Himself to take on human flesh and then humbled Himself even further when He sacrificed His life in the most humiliating way—death on a cross. What awaits prideful people? 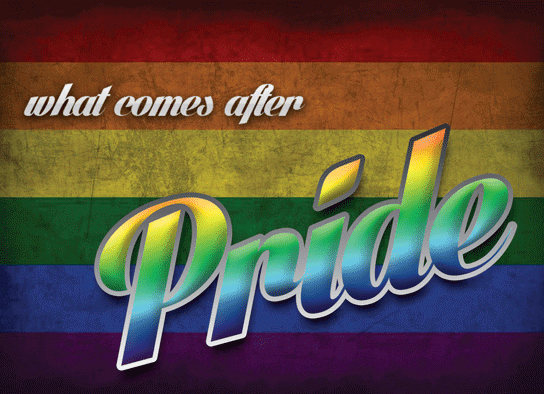 What comes after pride? Destruction (Prov. 16:18)—God’s judgment of sin, the punishment for which is eternity in hell. Your only hope is to turn from your sinful pride, turn toward God and, by faith alone, receive Jesus Christ as your Lord and Savior. Jesus Christ—fully God and fully man, yet without sin, voluntarily shed his innocent blood and died on the cross, taking upon Himself the punishment you rightly deserve for your sins against God. Three days later, He forever defeated sin and death when He rose from the grave. Yes, God is opposed to the proud, but He gives grace to the humble (James 4:6). Humble yourself. Repent and believe the gospel, today. You will notice a significant term missing from the text: homosexuality. While the front of the gospel tract draws the reader's thoughts toward the social and moral issue of our day--the issue by which God-hating societies will set out to try to destroy the Bride of Christ (His Church), the back of the gospel tract makes no mention of the topic--not even an allusion to it. 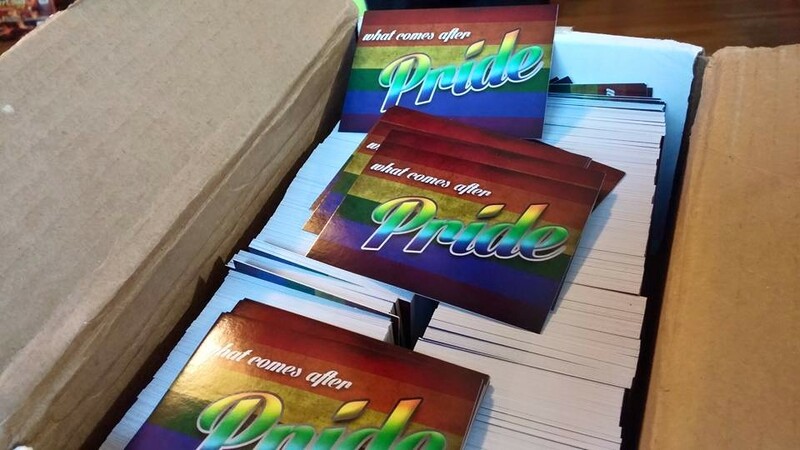 When a person receives this gospel tract, regardless of the form(s) of sexual immorality in which they engage (heterosexual or homosexual, thoughts or deeds), the reader will be compelled to consider a sin they love just as much: pride. Of course, what matters most is that those who receive this gospel tract will read it to the very end. Marv and I hope every recipient will read the biblical gospel message this tract contains, repent, and receive Jesus Christ as their Lord and Savior. I hope you will find this gospel tract useful in your evangelism efforts. May God receive the glory, and may the Lamb receive the reward for His suffering. Order your What Comes After Pride? gospel tracts today! While I needn't remind those who know me, for those who may have been drawn to my blog by this article, I am an advocate of the law enforcement community. I'm a retired, 20-year veteran of the Los Angeles County Sheriff's Department (1987-2007). Since I was 23-years-old, and until my dying breath, the law enforcement community has been and will be family to me. I love my brothers and sisters behind the badge. In the minds of some I am a "homer" when it comes to the law enforcement community, even though I have said innumerable times that the law enforcement community is far from perfect. The law enforcement community draws from the same fallible human race as every other profession. 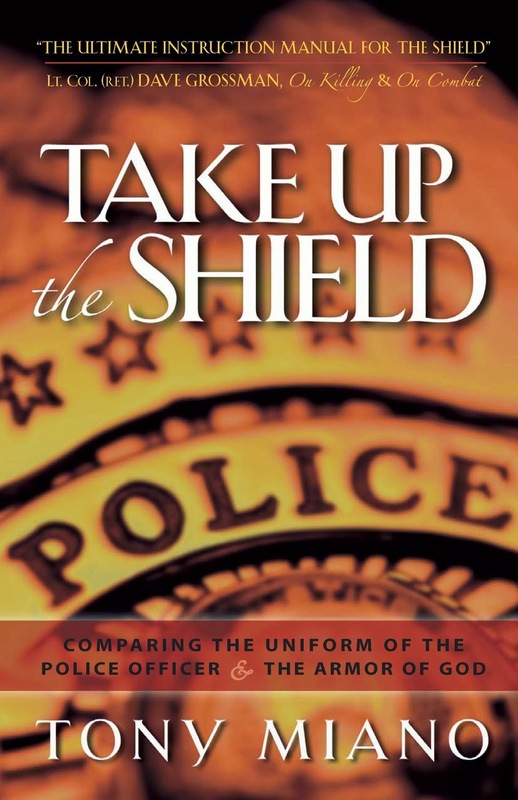 At the same time, I can't abide arm-chair quarterbacks--pundits (pastoral or otherwise) who are ignorant of what life is like behind the badge--people who don't have so much as a rudimentary level of knowledge regarding law enforcement policies and procedures, officer safety tactics, or the law (local, state, and federal) and its application. 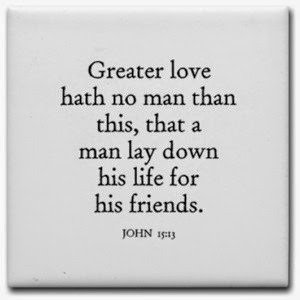 I get particularly riled when I see Christian social media sycophants jump on the "no justice, no peace" bandwagon to court favor with the unsaved masses, at the expense of a law enforcement community that, by and large, are motivated by a commitment to protect and serve. There are few activities in law enforcement more harrowing or more dangerous than a pursuit. It doesn't matter if it is a vehicle pursuit or a foot pursuit. Likely the most dangerous part of a pursuit is the pursuit termination--when the pursuit comes to an end. An officer is at considerable risk at the end of a pursuit--both physically and professionally. While the physical dangers are probably obvious, even to a civilian, the lesser considered danger is the danger to an officer's career. This is one of those times when, unless you have been involved in vehicle and/or foot pursuits, your understanding of what I'm about to say is woefully limited. Oh, you'll understand every word. This is not a matter of intelligence. But you won't be able to rightly or fully discern the emotion behind the words, because of what you lack. This is a matter of experience. Elevated heart rate and blood pressure. So much adrenalin released into your system that you can almost taste it. It's like the taste of lead with sulfur-based antibiotics. Respiration fast and shallow. Fear. Heavy, blinding sweat. Barely-controllable shaking. Indignation. Determination. Exhilaration. Relief. Anger. Hate. Rage. Massive emotional release resulting in unexplained and unstoppable tears. All of these emotions and reactions, and many others, are experienced either in part or in whole by officers at the end of pursuits. Any civilian who says he or she knows, without a doubt, how he or she would feel and behave at the end of a police pursuit is simply ignorant and arrogant. I say that the end of a pursuit is a very dangerous time for an officer's career because if an officer looses control of his emotions and is unable to keep himself in check, his career could be over. One too many punches; an out-of-character, gratuitous kick; an errant swing of the baton; one too many pounds of pressure applied by a shaking finger to a trigger, and a career could be over. Livelihood lost. Reputation forever sullied. Freedom taken away. Or suicide. I rarely, publicly comment on videos involving law enforcement, unless it is to call some of the before-mentioned people to account for their incendiary rhetoric in which they call for an officer's head on a platter based on a video clip chronicling only a portion of a much longer incident. I would like to think my engagement in these situations is consistent. "Wait." Wait for the investigation to run its course. If the investigation reveals the officer acted outside department policy or the law, then I will join you in calling for disciplinary action at the hands of the officer's department and/or through criminal court proceedings. I rarely comment on videos involving law enforcement because I don't want to become the arm-chair quarterback I loathe. Bad cops (and there are some) should be exposed and dealt with according to the law. If an officer's actions rightly warrants him to be at the defense table in a court room instead of at the prosecution table, so be it. That being said, I don't know if any of the deputies involved in this incident are "bad cops." This is to say I don't know if any of the deputies came to the end of this pursuit with malice aforethought or with a willful premeditation to do bodily harm to the suspect in the video. I don't know if any of the deputies in the video have a "jacket"--a reputation for having a heavy hand. I don't know if any of the deputies have prior incidents involving questionable uses of force. Integrity and conviction compels me to comment on the above video. I will not prejudge the deputies' hearts. But I have to say something about what I see in this video. These are the facts, as I know them. There are plenty of holes that need to be filled, which I'm sure the San Bernardino County Sheriff's Department will fill and make known to the public in the appropriate way and at the appropriate time. San Bernardino County Sheriff's deputies executed a search warrant at a location, as part of an investigation of identity theft crimes. At some point during the execution of the warrant, Francis Jared Pusok fled the location in a vehicle. Deputies initiated a pursuit. Pusok subsequently abandoned the vehicle and fled on foot. A coordinated manhunt ensued. Deputies received word that Pusok had stolen a horse and was trying to flee through rugged terrain. Pusok was spotted and deputies converged on his location. It is at about this point, or shortly thereafter, the above news chopper video begins. A police helicopter appears to spook the horse (nice move). Pusok soon falls off the horse and scrambles behind what appears to be a low shrub. After slipping and falling, a deputy contacts Pusok. It appears that Pusok initially prepares to flee or fight. It appears at this point the deputy deploys his taser. Pusok goes to the ground, either voluntarily or as a result of being tased. Pusok quickly extends his arms to his sides. Just as quickly, Pusok places his hands behind his back, palms up. Thus far, there has been no mention of Pusok being armed at the time of his arrest. As this is happening, a second deputy arrives. The second deputy appears to kick Pusok directly in the side of the head. There is a standard that governs the law enforcement Use-of-Force Continuum. An officer may use the level of force that is both necessary and reasonable to overcome the resistance of a person. In my opinion, the second deputy on-scene engages Pusok by using what can be described as lethal or deadly force. No, he didn't shoot Pusok. But lethal force can be applied in many different ways--not the least of which is a forceful booted kick to a person's head. The first officer immediately follows the second deputies head strike with a forceful, booted kick to Pusok's groin. At the very least, the force of this kick could have caused great bodily injury. There are documented cases in which men have died as a result of a kick to the groin. "In the two minutes after the man was stunned with a Taser, it appeared deputies kicked him 17 times, punched him 37 times and struck him with batons four times. Thirteen blows appeared to be to the head." If Channel 4 News reporting is accurate, Pusok was struck 58 times in two-minute's time, after he lied on the ground and put his hands behind his back. I've watched the above video many times. Over the course of the last 24 hours, I have thought so much about this incident that I can see it when I close my eyes. "Pusok’s previous brushes with the law span more than a decade through several counties in California, according to public records. "He pleaded no contest to felony attempted robbery in a 2006 incident as well as to several misdemeanor charges, including disturbing the peace and animal cruelty. 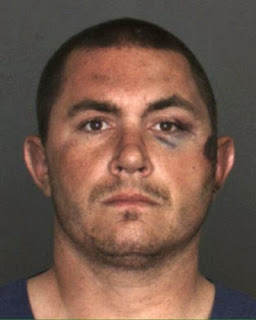 In December, he was charged in San Bernardino County with a misdemeanor count of resisting arrest; he pleaded no contest." "[Sheriff] McMahon said deputies had previously been called to a home where Pusok allegedly made threats to kill a deputy and fatally shot a family puppy in front of his family members. 'We were very familiar with his aggressive nature,' McMahon said." It is unlikely the media will ever refer to Pusok a hard-working, white, father of three. But I digress. The deputies who wrote and executed the search warrant against Pusok no doubt were well-aware of his criminal history, including the fact that he is known to resist arrest. Having written many search warrants myself, knowing a suspect had prior physical confrontations with law enforcement always put me and my team on a heightened sense of awareness. And we went into such search warrants ready and willing to fight, if the need to do so presented itself. The deputies' state of mind likely included the real possibility that Pusok would go "the hard way." However, what I saw in the video, without knowing any of the possible, prior, extenuating circumstances that may yet come to light, was an unlawful use of force. What I saw from the distance of a hundred miles (the distance from my living room to that plot of ground in the desert), and separated by the zoom lens of a television camera in a helicopter a thousand feet above the scene, was several deputies unlawfully assault Francis Jared Pusok, under the color of authority. My heart sank as I watched the video, over and over again. Another black mark in the history of my noble, God-ordained profession--for my family behind the badge. As of the writing of this article, the latest news reports indicate ten of the deputies involved have already been placed on paid, administrative leave. Some of them will likely be disciplined (suspensions, loss of pay, mark in their service records). Others may be fired. Some might face criminal prosecution. And Francis Jared Pusok, a criminal, is going to walk away with millions of dollars. As was the case with Rodney King, it is quite possible Pusok will head down the same road. Instead of committing crimes with no money in his pocket, Pusok will likely continue to commit crimes with a full bank account. Money never changes a person's nature. Money never changes a person's soul. Earlier this afternoon, I had a brief online conversation with a retired officer. He served with a large agency and retired a commanding officer. One of the thoughts I shared with him was this: Was there a man of God in the group of deputies on-scene? Was there not one man among the lot who had the integrity and courage to try to put a stop to what was happening? I've had another reoccurring thought--one that has troubled my spirit. What would I have done if I had arrived while the deputies were beating Pusok? And that thought is always immediately followed by an image in my mind. As the scene develops, I see myself yelling at the other deputies to stop striking Pusok. When that doesn't work, I lie down on top of Pusok and shield him with my body. Before you scream, let me assure you my thoughts about this scene, each time I see it in my head, never turn to heroism. There is absolutely no chest thumping or thoughts of, "Well, if I had been there, I would have....." The thought of shielding Pusok's body with my own causes me to cringe. It curls my toes. The visceral fear of the possible physical and professional consequences for taking such action is palatable. I don't think I can love Francis Jared Pusok enough to do that for him. My heart is not as pure as it should be. The spirit is willing, but the flesh is weak. There wasn't a deputy present who had the temerity to stop the beating. Pusok is a criminal. To some, a dirtbag. To many in law enforcement, people like Pusok are job security--the "them" of society. Yet what happened to him on that patch of desert dirt was wrong. To many outside of law enforcement, the deputies involved in this situation are the criminals. To others, the deputies are what's wrong with society. Everyone--the deputies and Pusok--need someone to step in, to put himself in harms way for them. More than that, the deputies and Pusok need someone who will literally lay down his own life for them. He is the Alpha and Omega, the first and the last, the beginning and the end. He was with the Father in and at Creation. All things—all things—were created by Him, and through Him, and for Him. Nothing has ever been made that was not made by Jesus Christ. He is the sinless Lamb of God who came to take away the sins of the world. He is also the Lion of the Tribe of Judah who will judge both the living and the dead. He is King of kings and Lord of Lords. He is sovereign over all things. He owns every person, just as He owns the cattle on a thousand hills, and it matters not if, at present, the person is in wanton rebellion against Jesus Christ or one of His born-again, beloved children. Jesus owns it all. Jesus owns us all. God is. God is one. God is Three in One—Father, Son, and Holy Spirit—One God in Three Persons—the Triune One—the Trinity—God. And this God, for there is only one God, is the God before whom every person will one day stand to give an account for their lives. Because God alone is truly and perfectly good, He will judge each person according to the perfect moral standard He has written on every human heart. Every person reading this knows that it is a sin to lie because you were created in the image of God, and God is not a liar. You know it is wrong to harbor bitterness, resentment, and hatred in your heart toward another person because God is not a murderer. You know it is wrong to fornicate (to engage sexually with a man or a woman outside the bonds of marriage between one man and one woman). You know it is wrong to look and think with lust. You know it is wrong to commit adultery. You know it is wrong to engage in homosexuality, lesbianism, or any other form of sexual depravity because God is not a fornicator or an adulterer. You know it is wrong to take the name of the Lord your God in vain, to bring his name down low and use it as an adjectival term of excitement, anger, sorrow, or fear, because God is not a blasphemer. God is true. God is love. God is faithful. God is holy. For the above reasons, and others, everyone who stands before God, including you, to give an account will do so without excuse. You won't be able to claim innocence or ignorance of violating God’s law—whether in thought, word, or deed. Because God is good, because He is holy, righteous and just, He must punish sin. The punishment God has determined for sin, all sin, is eternity in Hell. It matters not whether you, the reader, believe this. What matters is that it is true. Truth is not determined by what one believes. God is truth, though every person is found to be a liar. Truth is that which comports to reality, and any attempt to live life apart from the reality of God is to live a life of chaos, absurdity, arrogant denial, and sin. This same God—again, for there is only one God—who is angry with the wicked every day, whose wrath abides upon the ungodly, who will judge the world in righteousness, is the same God who is loving, merciful, gracious, and kind. And He showed His great love for mankind when He sent His Son to earth in the Person of Jesus Christ—fully God and fully Man, yet without sin. What God commands of you is the same thing He commands of me and all people everywhere, and that’s that you repent—turn from your sin and turn toward God—and by faith alone receive Jesus Christ as your Lord and Savior. You must come to God on His terms. God does not negotiate with sinners. God will not be bribed by your religious practices or what you may perceive as “good works” acceptable to God. God will not weigh your “good” against your “bad,” for God does not see you or anyone else as good—good in keeping with His standard of moral perfection. All have sinned and fallen short of the glory of God. If you do not read the gospel of Jesus Christ and see it for what it is, good news, it is because you love your sin more than you love God. It is because you love yourself more than you love God. It is because the love of God and the Truth of His Word is not in you. But if God causes you to be born again and extends to you the gifts of repentance and faith, which only He can give, then He will take your heart of stone and give you a heart of flesh. You will begin to love the things God loves and hate the things God hates. You will stop presuming upon God’s forgiveness as if it is something you have earned or deserved. Instead, you will have the confident assurance He has forgiven you—not on the basis of any deeds you have done in righteousness, but based entirely upon God’s mercy, grace, and love. May all (including the deputies and Francis Pusok) who read this who do not know Jesus Christ as their Lord and Savior repent and believe the gospel while God has given them time. May the Lamb that was slain receive the reward for His suffering! In Sye Ten Bruggencate's first film, How To Answer the Fool, viewers were given a glimpse of the mind of God. In his second film, Debating Dillahunty, viewers are given a glimpse of the heart of God. For the record, and for the purpose of full disclosure. I am an unapologetic apologist for Sye Ten Bruggencate. He is my friend. I love him as my brother in Christ, and I am indebted to him for his work in presuppositional apologetics. I know Sye's labors have not been in vain, for they have produced fruit in my life and ministry. 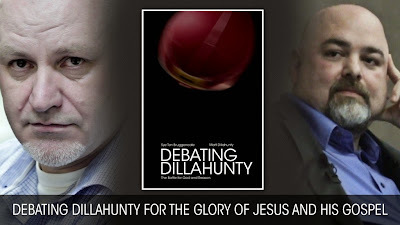 I watched Debating Dillahunty for the purpose of providing a review of the film. I entered into this process carrying with me the presuppositions that Sye would represent Christ and His truth well, and that the lies Dillahunty would tell regarding God would be evidenced by the fact that his lips were moving. Dillahunty is not my friend. No, I don't hate Matt Dillahunty. I pity him. I pity him the way I pity every human being who denies the God they know exists (Romans 1:18-25). I pity Matt and people like him because the Dillahunty Delusion (an all-too-common malady) is simply a byproduct of an absurd worldview (one that searches for coherence and meaning without God), which is born out of a love of self, a love of sin, and a hatred of God (Romans 1:31-32). The video begins by introducing the viewer to Matt Dillahunty, host of the online program "The Atheist Experience." Sye's detractors, which are legion, might come away from the opening scenes with the impression that the producers of the film sought to poison the well against Dillahunty. I don't believe that's the case. Dillahunty is an unashamed hater of God and a hater of God's people. The film simply paints him in his true light, at least as it pertains to his interaction with Christians. You can't poison a well already already poisoned by a heart blackened by haughty depravity. From here, the film moves into the debate proper. And from here, it becomes increasingly difficult to write a review. The reason: I want to write about every moment of it. The film is that good. However, to chronicle every moment of the film would make this review extremely long and might discourage people from watching the film. That would be a shame--an injustice, really. In his opening statement, Sye declares the debate over before it starts. He declares, "Matt's world view is dead; it just doesn't have the courtesy to lie down." He then proceeds to expose the inconsistencies of Dillahunty's worldview, using Dillahunty's own words to do it. Matt Dillahunty begins his opening statement of the debate by mocking Sye's opening statement. This is a common tactic among the intellectually dishonest and unarmed. "I can't defeat my opponent, so I'll mock him and/or his position." Dillahunty then makes a statement that provides the viewer with an "out"--a reason not to give any weight, credence, or even an ear to anything Matt would say for the rest of the film. Dillahunty makes a statement that frees the viewer from having to take seriously anything he says in the film, from this point forward. He makes a statement that frees the viewer to focus on the truth of Sye's argument and the loving heart behind it. Dillahunty says, "Knowledge and certainty are completely irrelevant." 15 minutes into a 45-minute film, Debating Dillahunty is over, but only in the sense that the debate is over. However, don't touch that remote or mouse. Take a deep breath and enjoy watching a man of God not only beautifully articulate the mind of God, but also the heart of God. You see: Sye does not see Matt Dillahunty as merely an intellectual opponent--someone to beat in a debate. Sye sees Matt as a pitiful soul, a fool (not as a character assault, but as a moral judgment). Sye sees Matt as a man who is lost and will one-day stand before the God he has always known--the God who, unless Matt repents and receives Jesus Christ as his Lord and Savior, will punish him in hell-fire for all eternity. "Say to them, As I live, declares the Lord God, I have no pleasure in the death of the wicked, but that the wicked turn from his way and live; turn back, turn back from your evil ways, for why will you die, O house of Israel" (Ezekiel 33:11)? God will take no pleasure in the physical and spiritual death of Matt Dillahunty. And neither will Sye. The reason: Sye Ten Bruggencate loves Matt Dillahunty. So, why did Sye Ten Bruggencate agree to debate Matt Dillahunty? Well, I'll let Sye answer that question with his own words. But you won't read them here. You'll have to watch the last eight minutes or so of Debating Dillahunty. If you come away from Debating Dillahunty having only been entertained, if you come away from this film having only your apologetic sword sharpened to a finer point, then you entirely missed the point of the film. If this is you, I have only one suggestion. I preached this sermon during the Herald Society at First Baptist Church of Milton (Milton, FL), on March 26, 2015. Following the sermon manuscript, you will find the audio for the sermon. I pray this is an encouragement to all Christians--pastors/elders, open-air preachers, and the Body of Christ-at-large. “No sort of defense is needed for preaching out-of-doors; but it would need very potent arguments to prove that a man had done his duty who has never preached beyond the walls of his meetinghouse. A defense is required rather for services within buildings than for worship outside of them. Apologies are certainly wanted for architects who pile up brick and stone into the skies when there is so much need for preaching rooms among poor sinners down below. Defense is greatly needed for forests of stone pillars, which prevent the preacher from being seen and his voice from being heard; for high-pitched Gothic roofs in which all sound is lost, and men are killed by being compelled to shout till they burst their blood-vessels; and also for the willful creation of echoes by exposing hard, sound-refracting surfaces to satisfy the demands of art, to the total overlooking of the comfort of both audience and speaker. The Prince of Preachers was right. It is not necessary to make a defense for the public proclamation of the gospel—a defense for open-air preaching. The biblical examples span thousands of years. The post-apostolic examples span 2,000 years. The arguments against open-air preaching are emotional, arbitrary, pragmatic, non-binding, eisegetical, and/or extra-biblical. And most arguments against the public proclamation of the gospel have as their sandy foundation a sinful fear of man, and a willful showing of preference to the King’s enemies over the edicts of the King. Accusing me of poisoning the well at this point, a well already putrefied by the philosophical and traditional dung of American Evangelicalism, would be like accusing an open-air preacher of pushing lost people away from Jesus. Push them where? To hell? Every lost person, in compliance with his sinful nature that hates God, is already willingly running toward hell. Push him away from Jesus? By his very nature, a lost person wants nothing whatsoever to do with Jesus. He is running toward destruction and away from life eternal. In order to push someone away from Jesus, I would first have to be able to catch them. But they already have a life-long, sinful head start on me, and they all are simply running too fast away from Jesus. The only way I could catch such a person to push him is if God the Holy Spirit stops him in his tracks, changes his heart, causes him to be born again, and changes his mind and direction 180-degrees—causing him to run the opposite direction, to run toward Jesus. At that point, any pushing I would do would be toward Jesus, through discipleship. While God’s sovereignty in all things, including the salvation of the lost, does not give me license to behave poorly, communicate ignorantly, or otherwise run rough-shot over people’s lives, it is that same sovereignty that informs my understanding that there is nothing I can do to push a person away from Jesus. I have neither the ability nor authority to undermine the eternally predetermined plan of God for a person’s life. So, in the time we have remaining in this session, with the before-mentioned presuppositions in mind, I will make a defense for the public proclamation of the gospel. And I will do so by focusing my attention on two Greek words: κηρύσσω and παρρησία. Let’s begin by taking an extended look at the Greek word κηρύσσω. 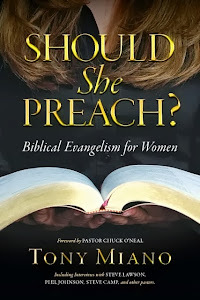 As some of you know, I wrote a rather unpopular book titled, Should She Preach—Biblical Evangelism for Women. In the book, I make what I believe is a sound, biblical case against the practice of women preaching the gospel in the open-air. While I affirm a Christian woman’s role in evangelism, I believe the Bible not only doesn’t give a mandate for a women to preach in a pulpit or on a box at the corner of Walk/Don’t Walk, but the Bible also does not allow for a woman to do so. The three main points of my argument are: 1) God’s created order; 2) a Christian woman’s role not simply in the corporate gathering of believers, but in any spiritual enterprise; 3) the gentle and quiet spirit to which God has given to every Christian woman. Having read all 60 New Testament verses in their context that use the word κηρύσσω (to preach), I did not find a single use of the word by a woman, of a woman, or as instruction to a woman. To point this out is not to put forth an argument from silence. Not only is the primary Greek word for preaching never used in the New Testament in relation to women, there is not a single instance in the New Testament of a woman engaging in the biblical practice of heralding the gospel in the open air. Preaching is teaching. Preaching is teaching with authority. Preaching is teaching people, believer and unbeliever alike, the way of eternal life, and doing so with a level of authority that calls the hearer to listen and obey. To preach the gospel is to teach the gospel. To preach repentance is to teach repentance. Any open-air message that does not explain (teach) the meaning of sin, righteousness, the coming judgment, Hell, the deity and hypostatic union of the Lord Jesus Christ, the cross, propitiation, regeneration, justification, salvation, grace, mercy, forgiveness, and eternal life is what? It’s unbiblical babble. It’s not worth the air being moved across the vocal cords. Now granted, not every open-air preaching opportunity allows for the articulation of all of the before-mentioned doctrines. Things happen (i.e. hecklers and other distractions, police contact, etc.). But the goal of every open-air preacher, during every message, should be to articulate these precious doctrines in terms his listeners can understand. Whoever stands to proclaim the truth of the law and the gospel is teaching that which he proclaims, whether they are doing it off the top of their head or with an open Bible in hand and expositing a text from the Word of God. Preaching is not the mere regurgitation of words void of emotion, meaning, message, explanation, and authority. Preaching is teaching. As stated in the above definition of kerusso, preaching is “always” accomplished “with the suggestion of formality, gravity, and authority which must be listened to and obeyed.” One thing that is lacking in the open-air preaching community is formality. Fortunately, I see positive changes happening in this area. Open-air preaching is not a game, sport, or hobby. It is not merely an opportunity for the Christian to exercise their liberty in the form of public expression. It is a calling, not a curiosity. It is a weighty responsibility, not a whimsical form of recreation. It is a privilege, not a right. It is for the glory of Christ, not the personal satisfaction of the preacher. The open-air preachers of old preached sermons in the open-air. Yes, great preachers like Charles Spurgeon called for brevity in the message, but not for a lack of sobriety. The bench, rock, horse-drawn cart, or tombstone upon which these blood-bought, Spirit-driven, Bible-wielding titans stood was reverenced like a hand-carved pulpit behind which a shepherd of a flock stood. They treated the ground upon which they stood as holy ground, for from that spot the Spirit of God would move upon the herald and the hooligan, in a manner the Father desired, for the glory of the Son and the gathering of His Elect. Open-air preaching requires gravitas. Gravitas is defined as “seriousness or sobriety, as of conduct or speech.” Gravitas is also defined as “seriousness, solemnity, or importance,” “a serious or dignified demeanor.” To preach (kerusso) is to articulate the Word of God and the gospel of Jesus Christ with a sense of gravity. Open-air preaching should be conducted by men with gravitas, men who understand the weightiness and the gravity of what they are doing. These men, by their demeanor and voice, can convey the gravity of the situation in which lost souls find themselves. The open-air preacher must carry himself with a very real air of authority. Even the lost, God-hating heckler should see that the open-air preacher speaks authoritatively, knowing the preacher ought to be listened to and obeyed. What I’m describing is known in law enforcement and military circles as “command presence.” A good open-air preacher is part orator, part herald, part diplomat, part street cop, and part field general. A good open-air preacher is one who does not manipulate a crowd, but can control a crowd with the sheer weight of his Holy Spirit-wrought, authoritative presence. People in the crowd will do what the street preacher says (i.e. “stop,” “wait,” “answer,” “be quiet,” etc. ), at times, without even realizing they are obeying the preacher’s commands. If you watch some of the men I consider the best open-air preachers of our generation, which include a number of men gathered here this weekend, you will see distinctly different personalities. You will see men who look and sound different from each other as they preach. However, in addition to a love for Christ, a love for His Church, a love for His Word, and a love for the lost, you will see another commonality in all of them. You will see command presence. You will see men acting like men: mature men, fearless men. You will see men who rightly divide the Word of God in the heat of battle. You will see men who are truly meek: men who are Holy Spirit- enabled to exercise power under control (Matthew 5:5). You will see men who are willing and able to give a defense for the hope that is in them, yet with gentleness and respect (1 Peter 3:15). You will see men who are uncompromising with the message: men who will not back down from truth merely so that the yet unconverted, sin-stained hearts of lost people will be appeased and remain unchanged. You will never hear God’s heralds of yesterday or today ask, “Can we all get along?” What you will see are men who rule their emotions, not men who are ruled by their emotions. You will see chivalrous men who defend and protect women, not men who act like women—not men who stand behind women, not men who are afraid of women. You will see men who speak with authority—an authority given to them by God—the authority that comes with their God-given gender-specific role as men and the authority that comes with the role of a herald of the King. I believe, with all my heart, one of the reasons why a vast majority of American Evangelicalism is against open-air preaching is this. American Evangelicalism is effeminate. Weak and compromised churches are producing weak and compromised men. Men considered men of God these days by American Evangelicalism are men who do not command respect, but who beg for acceptance. They are not men who stand firm, but instead are often men who can’t wait to bow their knees to culture. They fear other men, but they don’t fear God. Instead of spines straightened and strengthened by the rods of God’s Word and the proclamation of the gospel, men in American Evangelicalism are just like men in the rest of the world—spiritual invertebrates comfortable on the soft, pliable, conforming bean bag chairs of emotionalism, egalitarianism, ecumenism, and escapism. And they just comfortably sit there and wait—wait for a dying world to go to hell. For they care more about what people think of them than where people will spend eternity. No. Open-air preaching and sound, biblical open-air preachers aren’t the problem. Cowards hiding behind the cross instead of denying themselves, taking up their crosses and following Christ: they are the problem. Look: if my heart ever stops beating and I stop breathing, I want someone trained in its use to shove a tube down my throat and pump air into my lungs. I want them to jump up and down on my chest, crack my ribs if they need to, and bring my ticker back online. And if they’re able to bring me back to life, when I regain consciousness my chest is going to hurt and my throat is likely to be sore from the intubation. But I’m pretty confident of this. I’m not going to sue the paramedics who worked on me. I’m going to shake their hands and thank them for a job well done. I will be glad that the paramedics were more concerned with my life than how uncomfortable my recovery might be. I will be glad that they were decisive, commanding, demanding, skilled, undaunted, and cared enough about a human being to fight for my life—a life that might never be of any personal benefit to them. If Mahria or someone else were to find me clinically dead, I want some bold person to rush to my aid and do their job. The last thing I want is some faint-of-heart, fearful, shy, uncertain person strolling up to my body and vacillating about what to do, worried about what I will think of him if he engages in life-saving efforts without first getting my consent. I’m dead! I can’t consent! Do your job! Save my life! Yes, American Evangelicalism is uncomfortable with open-air preaching; American Evangelicalism is afraid of open-air preaching because these days boldness in the church is seen as making friends with an unbeliever who looks like you, talks like you, shares some common interests with you, and won’t be too upset if five years from now you invite him to church. 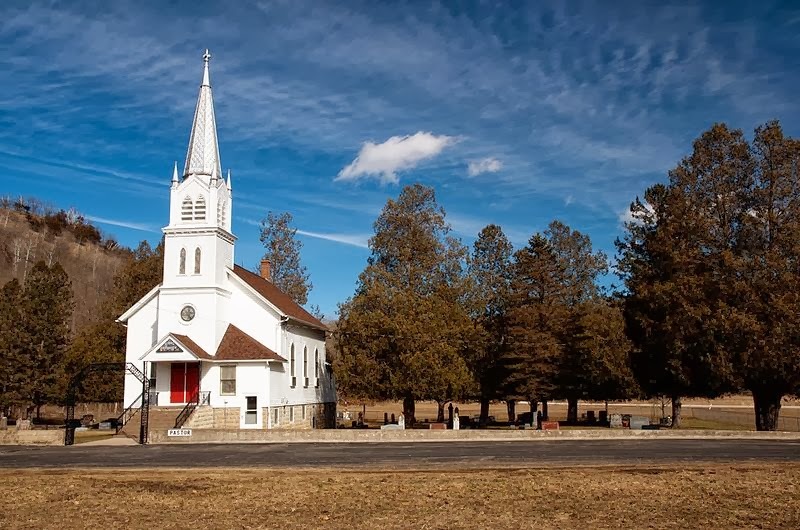 American Evangelicalism is opposed to open-air preaching, not because it is unbiblical, but because the public proclamation of the gospel might draw unwanted, negative attention to Christian clubhouses across the country. American Evangelicalism sees boldness as sending vacationaries—people who often think so highly of themselves that they actually believe people can see Jesus in them—to faraway places to take pictures with disadvantaged children at an orphanage, or to take pictures of driving nails into a half-built home, between trips to Starbucks. American Evangelicalism sees service without the verbal or written communication of the gospel as a bold statement for Jesus. It’s not. The Bible defines boldness much differently. Acts 3-5 is one of my favorite sections of Scripture. It is three chapters of public proclamation of truth, prayer, and boldness—great boldness. This particular episode began with Peter and John healing a lame beggar who was sitting outside the Beautiful Gate. The ever-growing crowd followed the apostles to Solomon’s Portico where Peter is preaching an extraordinary and convicting sermon in the open-air (Acts 3). Turn with me to Acts 4:1-31 (READ PASSAGE). The Greek word in verse 13 translated in the ESV as “boldness” is the word παρρησία. Various constructions of this word appear 31 times in the New Testament. Needless to say, time precludes us from looking at all of the references. By definition, the word means: freedom and unreservedness in speech; free and fearless confidence; cheerful courage; the deportment by which one becomes conspicuous or secures publicity. Public speech is imbedded deep in the meaning of this word. The biblical definition of “boldness” is the very antithesis of what is common and encouraged in American Evangelicalism. In his Pentecost sermon, Peter referred to his preaching as μετὰ παρρησίας, with boldness, with freedom, with confidence. He was unashamed. He was unafraid. He would not be deterred. Only physical death could stop him from testifying for the glory of Christ and the salvation of the thousands of people gathered in the open-air, in front of him. The Peter in the courtyard late that horrible night who, before 3 AM, as Jesus prophesied, would deny the Lord, was gone. Now, the Peter who the Lord would use to gather His elect during the infancy of His Church—was the King’s chief herald. Luke the Physician would also describe Peter and John’s preaching as bold. First in Acts 4:13. Sadly, today the term “shock and awe,” when used in reference to open-air preaching has been hijacked by heretics—Pelagians, Open Theists, Sinless Perfectionists, false converts, apostates. Yet, in the eyes of the Pharisees, that’s just what Peter and John were—“shock and awe” preachers. Here were two men who the religious elite saw as village idiots—ἰδιώτης, uneducated men. Yet these two men who the Pharisees recognized as having been with Jesus astonished them. They marveled at how boldly Peter and John publicly spoke. The confidence, freedom, and courage with which the two apostles spoke caused the Pharisees to wonder. The apostles were following in their Master’s footsteps—their Master by whom people were once astonished because of the authority with which He spoke. “And when Jesus finished these sayings, the crowds were astonished at his teaching, for he was teaching them as one who had authority, and not as their scribes” (Matthew 7:28-29). Now these simple fishermen, turned disciples, turned evangelists, turned public heralds of the gospel spoke with an alien authority given them by their King, through salvation by the grace of God alone, through faith alone, in Jesus Christ alone. Luke uses the word παρρησία again when recounting the prayer of Peter and John’s Christian friends in Acts 4:29. After Peter and John recounted for their friends the threats made by the religious elite if the apostles dared to preach Christ and Him crucified, the fledgling Church asked God not for protection. They did not ask for acceptance by their culture. They did not ask for a slick, man-centered strategy with which they could woo haters of Christ. They didn’t ask for wisdom and discernment for figuring out how to preach Christ without people knowing that’s what they were doing. No. Peter, John, and how ever many Christians gathered at this crucial moment in Church history asked for more of the same—more boldness so they could look upon the threats of the haters of God and lovingly shove Jesus right down their fleshy open sepulchers. They spoke. These Christians opened their mouths for the glory of God and the proclamation of the gospel. The lie had not yet been told in the Church that a Christian should live their life in such a way that would lead spiritually blind (1 Corinthians 2:14) and spiritually dead (Ephesians 2:1-3) people to ask them why. The lie had not yet been told in the Church that Christians should preach the gospel at all times and when necessary use words. The lie had not yet been told in the Church that Christians should wait until the enemies of God give them permission to obey God’s command to preach the gospel to all people everywhere. The lie had not yet been told in the Church that before a Christian could proclaim Christ and Him crucified to a lost person, he first had to develop a relationship with that lost person so the Christian could earn the right to speak. The lie had not yet been told in the Church that lost societies, lost cultures had the authority to play the spiritual FCC and determine for the Church where, when, and how Christians could talk about Jesus. No. These Christians opened their mouths for the glory of God and the proclamation of the gospel. Praise God! The formation of today’s unbiblical, anti-gospel American Evangelicalism was still 1,800 years away! The biblical defense for open-air preaching is provided by Scripture. To boldly preach the gospel of Jesus Christ is to herald the message publicly, with one’s voice, sometimes loudly. Now, this is not to say that the only Christians who boldly preach the gospel are open-air preachers. Far from it. The gospel can be boldly preached from a pulpit, of course. The gospel can be boldly preached across a sticky, wooden table at Starbucks. It can be boldly preached in a philosophy class term paper. It can be boldly preached by the homeschool mom at the dining room table. It can be boldly preached by the shaky, nervous hand distributing gospel tracts. As I began this message, I say again: the defense for the public proclamation of the gospel from the mouth of a herald standing on a step-stool, park bench, or block wall is that no defense is necessary. From Noah to David, to the prophets, to Jesus, to the apostles, Scripture affirms the open-air proclamation of the gospel. Open-air preaching is every bit as biblical as the preaching of a shepherd from his pulpit, or as the one-to-one conversations between friends or strangers, or as the distribution of the gospel in written form whether letter or gospel tract. Gospel preaching always involves speech, whether verbal or written. Biblical boldness always involves speech, whether verbal or written. There’s no getting around it. Biblical preaching and biblical boldness demands unafraid, unfettered, unapologetic, unflinching communication with words. And one cannot remove open-air preaching from biblical examples without first changing the definitions of biblical terms. Even the thought of doing so is sinful. So, I would like to close with a word to the open-air preachers gathered here today. The open-air preacher must have a boldness that is seasoned regularly and perpetually with humility. He must see himself as the least worthy to publicly declare the edicts of King Jesus. While he is indeed given a special privilege, he is by no means a special class of Christian. Paul understood this. Similarly, the open-air preacher must have a boldness that is exercised judiciously, giving deference to another brother or sister in Christ whenever appropriate and practical. “Accordingly, though I am bold enough in Christ to command you to do what is required, yet for love's sake I prefer to appeal to you—I, Paul, an old man and now a prisoner also for Christ Jesus” (Philemon 1:8-9). The open-air preacher must have a boldness that can be found well-beyond his favorite corner or campus. He must be bold in season and out of season. He must be bold if standing before a crowd of hundreds or locked alone in a cell. He must be bold without the limelight, without the attention, without the notoriety or publicity that being a public spectacle can bring. “He lived there two whole years at his own expense, and welcomed all who came to him, proclaiming the kingdom of God and teaching about the Lord Jesus Christ with all boldness and without hindrance” (Acts 28:30-31). The boldness of the open-air preacher must be seen in his love for the Church, for his Christian brethren. His boldness must come from a heart that would never intentionally wrong, corrupt, or take advantage of a brother or sister in Christ. His pride should be in others, and not in himself. He should be willing to take a bullet for any of his eternal kin. And I will close with this admonition. While no defense is necessary for the open-air proclamation of the gospel, this does not mean that every Christian man is called to the age-old, biblical, and warranted discipline. Whether you are an open-air preacher today, or you see yourself as an open-air preacher one day, it is not enough for you to examine yourself, to test yourself. It is not enough for you to qualify yourself. And it is not enough for your fellow open-air preachers to examine you, test you, and qualify you. That is the role, responsibility, and privilege of your pastors/elders. Humbly, selflessly, sacrificially, and lovingly submit to the shepherds in your life. Finally, to my brothers and sisters in Christ gathered here who are not open-air preachers: your faith in Christ was never intended to be a private matter. The purpose of a lamp is always to shed light. Unless a lamp is lit, it is a useless ornament and nothing more than a decorative piece of furniture. God has given every Christian boldness—some more than others—but every Christian has boldness as part of their new nature. The question is will you light the room by boldly opening your mouth to proclaim the gospel? Or will you settle for being an ornament, a decorative piece, serving little to no purpose. But there is much more to bold preaching than public speaking. The public herald of the gospel must be a bold man with solid Christian character. And here is the audio of the sermon.